Ethical Boardroom Magazine’s 2017 Summer Edition, published early August 2017, features an article by Michael Pedersen, which offers an account for noteworthy developments in sport governance in 2017. In the article, Michael offers perspectives on the scope of critical sport governance issues and emerging sport governance solutions at national, international and issue-specific levels. The article, titled “Good Governance: The Foundation for Playing a Beautiful Game”, is available in its full length through the link referred to furthest below. Critical sport governance issues referred to in the article include aspects of the political and operational integrity of a sport organization such as conflicts of interest, a culture of yes-saying and lack of transparency and accountability. Issues referred to also include aspects of a levelled playing field for athletes such as doping, match-fixing and unequal access to sport participation. Other issues referred to include aspects of sport event integrity such as bidding processes as a source of corruption, unfair ticket pricing and distribution as well as selection of sponsors and media broadcasters as a source of corruption. Emerging solutions referred to in the article include national, international and issue-specific levels. At a national level, common frameworks and tools for good governance are being developed in some countries – in some cases with their implementation as a prerequisite for national sport organizations to remain eligible for full public funding. At an international level, organizations such as the International Association of Athletics Federations (IAAF) are following FIFA’s lead in developing solutions and subjecting themselves to comprehensive governance modernization. At an intergovernmental level, various sport governance solutions are being developed too, including the European Commission Pledge on good governance in sport. At an international multi-stakeholder level, the development of the Sport Integrity Global Alliance (SIGA) is particularly noteworthy. Last but not least, at an issue specific level, various new organizations are being developed too, including the Sports and Rights Alliance, Sport and Sustainability International and Safe Sport International. 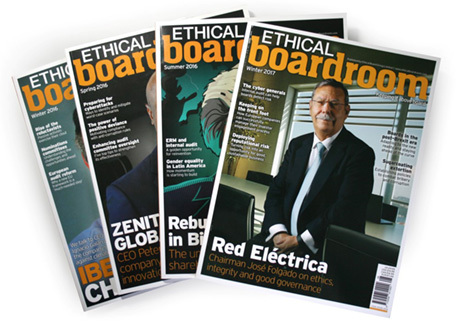 Ethical Boardroom Magazine has an audience of 48,000 board executives globally. The Magazine is widely acknowledged for its unparalleled in-depth coverage and critical analysis of complex and pressing governance issues, which positively and negatively influence boardroom leadership, boardroom committees, ethics and compliance, shareholder engagement, activism and risk management strategies.